When did it become acceptable for elected officials who are sworn to uphold and defend the laws of cities, towns, counties, states and the Federal government to pick and choose which laws are enforced? No matter the administration, those on the right or left side of the aisle, our elected leaders at many levels have failed in their sworn duty to uphold and enforce US law. Their collective failure is beyond despicable. In 1989, our government promised to seal the border. In 1989, our government promised to make sure that all who worked in the United States would be legal citizens or have 'green' cards. I-9 is on file to prove that the person hired has proper photo identification and a valid Social Security Card, and can legally work in the United States, all of them, including santuary cities. Since that law was passed the sieve that has become our southern border is shameful. Our immigration problems rage out of control. In direct violation of the 1996 federal law , the Illegal Immigration Reform and Immigrant Responsibility Act ( IIRIRA ) many cities both large and small have chosen to designate themselves as sanctuary cities. 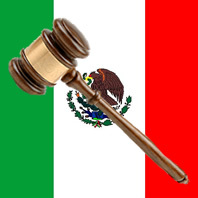 The IIRIRA law of 1996 requires local governments to cooperate with Department of Homeland Security's Immigration and Customs Enforcement (ICE). However many large urban cities and some small communities have adopted what are called "sanctuary policies." In broader terms, this means that sanctuary policies instruct city employees to break Federal law and not report the presence of illegal aliens living in their communities to the federal government. The policies also end the distinction between legal and illegal immigration--so illegal aliens often benefit from city services too. Nationally the impact of this lunacy has caused an explosion of budget strains for every state with a border common to Mexico. Healthcare, education, law enforcement and community services provided to these law breakers are wrecking economies in California, Arizona, New Mexico and Texas. As a direct result of administrations from both sides of the aisle's refusal to enforce federal law and make our borders secure, along with policies that enable those who have entered this country illegally to take advantage of don't ask don't tell employment practices we now have over 13 million illegal aliens in the United States. 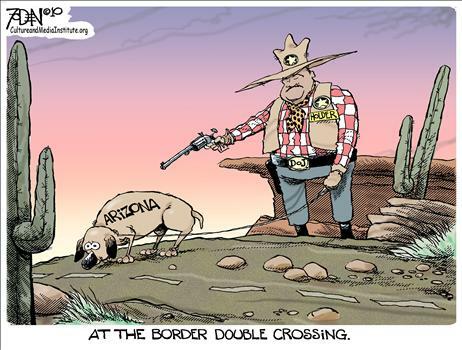 Obama Promised 1200 troops along the border. But these troops are not sent to stop the flow of illegal immigrants, but to have desk jobs. 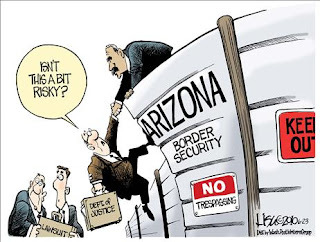 John Morton, who heads U.S. Immigration and Customs Enforcement, said his agency will not necessarily process illegal immigrants referred to them by Arizona officials.http://www.alipac.us/article-topic-32.html . ON MONDAY, a number of Senators led by Sen. Chuck Grassley (R-Iowa) Sen. Hatch (R-Utah), Vitter (R-La. ), Bunning (R-Ky.), Chambliss (R-Ga.), Isaakson (R-Ga.), Inhofe (R-Okla.), Cochran (R-Miss.) demanded answers of a possible plan by the White House to provide an Amnesty to the nation's estimated 11-18 million illegal aliens through an executive order. The move would take immigration enforcement out of the hands of Congress and place it in the hands of the Executive Branch. Call, Fax, Email or see your Members of Congress at (202) 224-3121 to express your outrage at Pres. Obama's plan to provide Amnesty through Executive Order. READ THE LETTER SENT TO PRESIDENT OBAMA BY THESE LAWMAKERS AT NumbersUSA. Already over 112.000 faxes have been sent by irate Citizens-legal residents to legislators throughout the country. IF SUCH A TRAVESTY HAPPENED, WITHOUT THE PEOPLES VOICE AND VOTE, THE CONGRESS IMPEACHMENT COULD BE IMPOSED ON ALL INVOLVED? Copy and paste and distribute freely. No copyright for any of my comments or articles.